My last Extra Special Bitter (ESB) used continual hopping with Styrian Goldings. This version abandons that (primarily because the Zymatic can't simulate it) in favor of four hop additions. This version also includes an ounce of Special B to bump up the malt complexity slightly. I'll also use Wyeast Thames Valley Ale Yeast this time around because I'm already using half the package for the Manny's Pale Ale clone I'm brewing and it'll shave a little off the cost of this batch. According to Wyeast's web site, this is an appropriate ESB yeast. I've also decided to add a few pellets of East Kent Goldings to bring a little bit of a familiar flavor to the beer without overwhelming it. The brew went according to plan, though the grain bed did not get completely soaked. The edges in the front and back on the left-hand side remained dry. Despite that, gravity came out fairly close to the expected number and the volume was closer than I've often been with the Zymatic. I pitched half of the yeast in the Pale Ale and the other half in the ESB. I also pitched half of a vial of Clarity Ferm into each beer, to remove the gluten and help reduce chill haze. After brewing this batch, I re-read the Zymatic manual on the subject of cleaning. I ran two full rinse cycles through the machine, washed the step filter, and re-read the manual on the subject of cleaning. I removed the posts from the keg to find that they were badly soiled. I removed them, disassembled them, and cleaned them well with PBW. After rinsing them, I reassembled them and the were good as new. The dip tubes were also cleaned. I'm ashamed to admit that I missed that part of the cleaning process in the manual. That explains some of the trouble the system seemed to be having flowing wort in and out during the brew. 02/28/2018: After a couple of evenings of the airlock on the fermenter appearing totally still, tonight there is some bubbling from the airlock. When you place just over 2 gallons in a 7.5 gallon fermenter, it takes a while for the yeast to generate enough CO2 to cause airlock activity. 03/02/2018: I've kept the beer in a cooler part of the basement in lieu of temperature control. The thermometer has shown it staying down in the lower 60's despite airlock activity being visible now. A sample pulled from the fermenter was a little sulfury by not very sugary, indicating that fermentation is moving along nicely. 03/05/2018: The airlock activity has been non-existent for a couple of days, so I have dosed the beer with gelatin finings and moved it into my mini-fridge to cold crash for a few days before bottling. 03/10/2018: The beer was bottled today, using 1.5 ounces of corn sugar. Yield was 24 twelve-ounce bottles. The bottles were placed in a 72F "hot box" for conditioning. Final gravity registered 4.75 Brix on my refractometer. Given the OG, BeerSmith calculates that the beer finished at 5.7% ABV and claims the FG is 1.002 SG. It should be ready to taste test on March 18. 03/17/2018: I poured a bottle of the beer to try it out. There was a strong diacetyl aroma to it, but the flavor was otherwise fine. I will need to give this beer more time to condition, so that (hopefully) the yeast will clean up this buttery aroma. 03/29/2018: I opened another bottle tonight. It poured a nice deep copper color with finger-thick beige head that lasted quite a while and left some spotty lacing in the glass. The aroma is primarily malty with a touch of herbal hops. 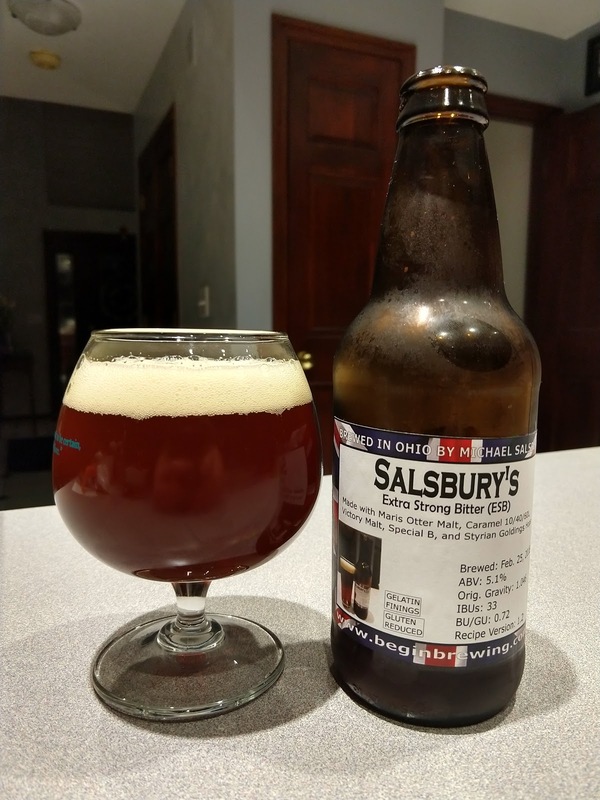 The flavor starts with a mild hop bitterness, which gives way to a malt-filled middle that mixes hints of biscuit, slightly toasty, and a hint of caramel and plum. The mouthfeel is medium bodied. For my taste, it's a touch too dry and bitter, but not extremely so. The diacetyl I detected in the earlier tasting is gone now. I need to do a side-by-side with v1.1 to see whether I want to take v1.1 or v1.2 into competition. 04/07/2018: It occurred to me why the beer seems too bitter. The hopping was based on a final volume of 2.5 gallons, but the Zymatic rarely produces a batch that high. When you recalculate the IBUs based on the actual yield of 2.3 to 2.4 gallons, the bitterness rises from 33 IBUs to over 47 IBUS. This is still within the BJCP guidelines for the style, but only barely. This implies that I need to revamp my hopping in future to assume a 2.3 gallon batch in order to avoid over-bittering. 04/09/2018: Three bottles of the beer were left at Barley's Ale House for their annual home brewing competition. I should have the results in a couple of weeks. Bitter, almost astringent and lingering. Doesn't beg for another sip. Not good malt balance. Very malty, but dry. Biscuity, toasty. Nice malt flavor but really lacking hop flavor and bitterness. Needs better balance and lighter color. Back off some of the darker malts and replace with lighter caramel. Solid take on style. Hops seem slightly overbearing on the end. Flavor is nice and clean, but almost totally lacking in hop character that you would expect for this style. Note that each bullet above represents the comments of one specific judge. While the scores were within a 5-point range, the judges' comments were interesting. One judge described it as lacking hop character and bitterness, while the other two felt (as I do) that it was a bit too bitter. My own quick score for the beer was a 35, which is a bit higher than the Barley's judges, but close enough. 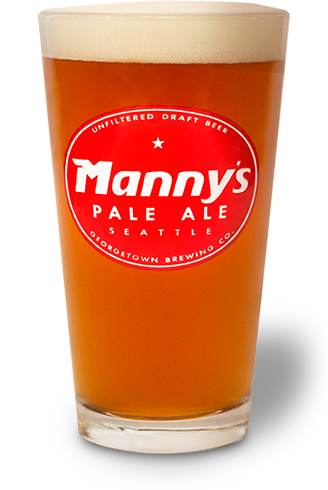 One of my relatives spent time in Seattle and fell in love with Georgetown Brewing's Manny's Pale Ale. Now that he is here in Central Ohio, he can't get the beer anymore. I thought it would be nice to try to brew a clone of the beer for him. For the next step, I formulated a tentative recipe based on the image of the beer on their web site and the above information. I asked the brewery by email if the brewers would offer any advice. All I learned was that they recommended using the Wyeast 1275 Thames Valley ale yeast. On the hops side, the consensus seems to be that Summit or Magnum hops was either used at the start of the boil or at the 25 minute mark, with Cascade used later in the boil and for dry-hopping. With this analysis as the basis, I formulated my first-guess recipe. I decided to add the Summit late in the boil so that I could increase its flavor contribution without overshooting the target bitterness level. Adding gypsum should also help to punch up the hops flavor. I measured the ingredients and loaded them into the Zymatic, then powered it on and got it started brewing. About 5 minutes into the process, our Internet connection inexplicably dropped. When it did, the Zymatic shut down and waited for me to tell it that the Internet was back. I found this rather annoying. It should have downloaded and held the brewing program, so it should have been able to tolerate a missing Internet connection for a few minutes. I would have been fine with losing the temperature data and status information it collects - but not so happy losing a batch of ingredients. After resolving the Internet connection and restarting the brew process on the Zymatic, it continued with the Dough In process. Near the end of the boil, the machine made some slurping noises that seemed to indicate a clog. I ran several rinse cycles after the brew, which pushed out bits of "gunk" that probably were associated with the clog. After that, it seemed to behave fine. The original gravity measured 13.0 Brix, which (after adjustment) works out to 1.054 SG. That's within two points of the estimated 1.056 SG that the recipe software predicted. The wort was chilled to yeast-safe temps, treated with Clarity Ferm, and the yeast pitched into it. Since there was enough yeast to consider doing a second beer, I brewed my ESB after that so I could split the yeast between the two beers. 03/02/2018: I've kept the beer in a cooler part of the basement in lieu of temperature control. The thermometer has shown it staying down in the lower 60's despite airlock activity being visible now. A sample pulled from the fermenter was a little sulfury and a bit sweet, implying that the yeast still has a bit of work to do. 03/11/2018: Today, my wife and I bottled the beer using Cooper's Carbonation Drops for priming sugar to ensure a consistent level of carbonation across the batch. The beer already has a decent flavor, though if I had dry-hopped it as I originally intended, I think it could be better still. Unfortunately, life got in the way and I didn't have a chance to drop in the dry hops until fermentation had finished - which runs the risk of oxidation. The refractometer registered a final gravity of 6.1 Brix, which BeerSmith says is a final gravity of 1.005 SG and an alcohol content of 5.7%. The beer should be ready for taste testing on March 18. 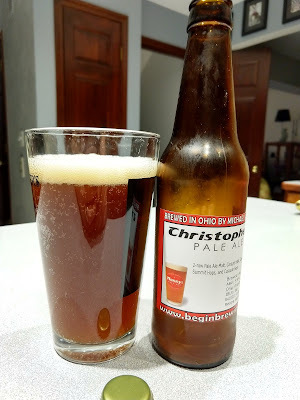 03/15/2018: Taking a bottle of the beer out of the hot box and chilling it, I was disappointed to discover that despite the recipe creator showing a color comparable to pictures of the real Manny's Pale Ale, this beer is considerably darker - a deep brown in fact. It's nothing like a pale ale. Although drinkable and pleasant, I consider the recipe a failure and will be brewing a 2.0 version ASAP. As you can see below, it's almost a dark copper color. Flavor is fairly caramel-forward with hops in the background - nothing like a pale ale should be. It's a drinkable beer, for sure, but not a good one. I received my PicoBrew Zymatic in late December 2017. Since then, I have brewed 12 batches of beer in it. I've developed a reasonable understanding of its good and bad points. On the positive side, it's insanely easy to brew with it. Measure your ingredients, load them into the system, load the recipe, hit a button, and wait. It's mostly a hands-off process from there. When it's finished (and because I don't want to ferment in the corny keg), I transfer the beer to a kettle, chill it, then transfer to a fermenter. This process takes about 20-30 minutes. Cleanup is easier than with my previous system, and parts of that are automated as well. The Zymatic gives off a "brewery" aroma if you're within about 10-20 feet of it, but is undetectable outside that range (at least to me). The beer coming out of the Zymatic is as good as any I've made elsewhere. On the negative side, the machine has its limits. Compared with other brewing systems, it's not as efficient. Depending on the recipe, grain crush, and mash profile used, I've seen brew house efficiencies as low as 55.3% and as high as 76.4%. With The Grainfather, I don't recall ever seeing an efficiency below 70%. So you need more grain to hit a gravity target with the Zymatic than with The Grainfather. That combines with the fact that the Zymatic has a 9-pound grain limit (versus The Grainfather's 20 pound limit). This means the bigger, higher-gravity beers aren't as easy to brew with the Zymatic. They're possible, but you're going to be resorting to things like adding malt extract, doing reiterated mashes, or boiling down the wort to increase the gravity. The Zymatic is also unpredictable in its finished volume amounts. Despite specifying a 2.5 gallon volume in the recipe crafting tool, I frequently end up with 2.1 to 2.2 gallons of wort. This isn't a big deal, but if you were planning on that extra (approximately) half gallon for some reason, you'll be frustrated. With the exception of the Dubbel, those all came within 3 points of the estimated gravity. I'm not sure why the Dubbel came out so low. Maybe I didn't measure the water as carefully. Probably the worst thing about the Zymatic is that it can overflow its grain tray during the mash if you are not staying on top of it. A mash that brushes up against the 9 pound limit, or one that includes a significant amount of wheat or oats, or just giving it a bit too much water, can result in a real mess. The very first batch I made, their Pico Pale Ale kit, foamed excessively out of the grain tray, overflowed the drip tray, and made a huge mess on the floor that took a while to mop up. I had only left the machine alone about 10-20 minutes. Two other batches of the 12 I've made have had foaming or overflow problems as well. One of those was relatively minor and resulted in a tiny puddle on the table. The other was huge. It covered most of the table top, almost the entire shelf underneath the table top, and a path across the basement floor to the drain, where it puddled up a fair amount. That took a while to clean up. I've made it a habit to check on the machine about every 10 minutes during the first 30-40 minutes of mashing, just to watch for potential foaming or overflow issues. Making sure the machine is level, that you're measuring water carefully and not getting too close to the grain limit will help. The other frustrating thing about using the Zymatic is the recipe editor. You have two mash profiles by default - a normal single infusion mash and a high efficiency mash. The normal infusion mash is incredibly inefficient. That's the batch I had 55% efficiency on. The high-efficiency profile delivers on its promise but can only be edited in their "advanced" mash profile editor. That editor is easy enough to work with, but there's a catch. If you change the profile and save it, then go back to change an ingredient (e.g., to correct the alpha value of the hops), the changes in the advanced editor are discarded. If you're not aware of this quirk, you'll find that the mash doesn't behave as you intended (it goes back to the default). This is a huge bug that I'd think PicoBrew would fix, but they don't. Still, I give the device credit. It's allowed me to focus on recipe development, to brew on days when I couldn't afford the time to stand over a mash and kettle, and to easily make smaller batches (and thus avoid accumulating too much homebrew). Despite its frustrations, I am overall happy with it. 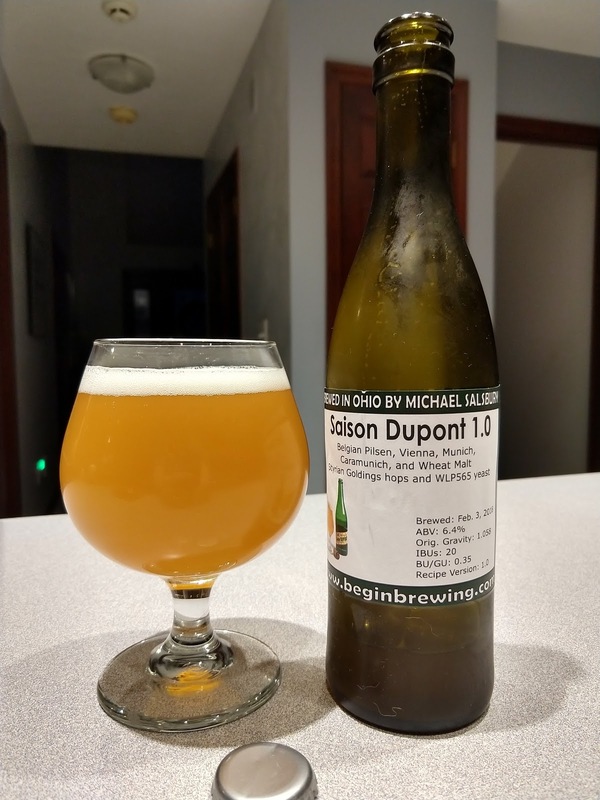 Probably my favorite Saison out there is Saison Dupont. 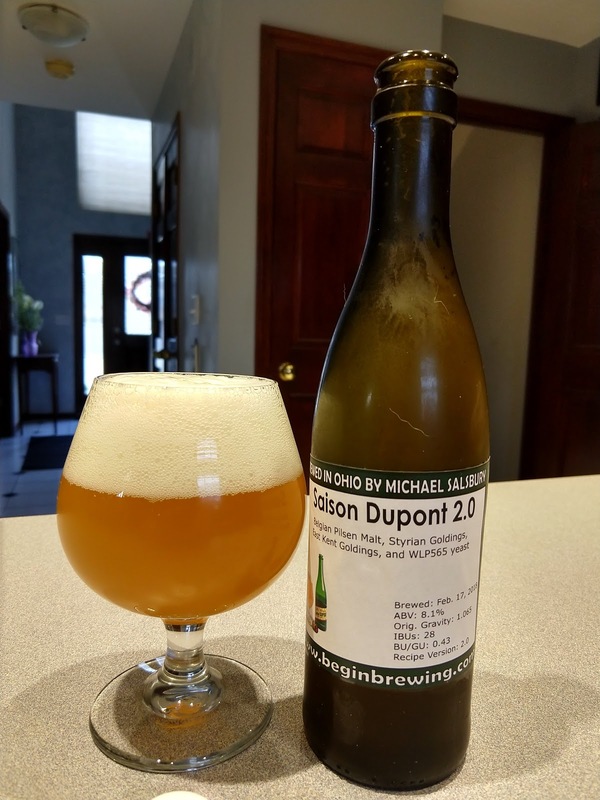 I recently read Jeff Alworth's The Secrets of the Master Brewers and reviewed his notes about how Dupont's beer is made. I used this to inform my own Saison recipe which will hopefully come close to it. Dupont uses untreated (but very hard) hard water from their well to brew the beer, and they don't consider it to be a crucial element in the beer's flavor. Although Dupont uses a 90-minute boil over an open flame (to deepen the color), you should be able to use a 60-minute boil if you add a color malt to the grist. Dupont's strain of yeast was the basis for Wyeast 3724 and White Labs WLP565). This strain doesn't do well at low temperatures and needs good aeration to avoid stalling out. Dupont uses 100% pilsner malt. Dupont mashes in at 113F, then raises the temperature slowly over the next 1.75 hours until it reaches 162F. Then they boil over 90 minutes to reach the gold color they want. Dupont generally hops with Belgian-grown Goldings hops but does sometimes alter this depending on the available crops. They only use two additions, one at the start of the boil and one in the last minute of the boil. Dupont uses shallow, square fermenters. The Dupont yeast is pitched at 77F and reuses the yeast up to 100-150 generations. They let it ferment at temperatures up to 102F before doing anything to lower the temperature. Primary fermentation lasts 1-2 weeks. A different culture is used for bottle refermentation, and conditioning takes 6-8 weeks. Bottles must be laid on their side during conditioning or the beer doesn't taste right. They don't pitch large quantities of yeast, but relatively small amounts. This, their brewmaster says, seems like a small thing but it makes a really big impact on the beer. Underpitching the yeast stresses it and causes it to develop esters. With all that said, here's my attempt at a Saison Dupont clone. Although I'm not a big fan of East Kent Goldings, I thought they might lend a bit of citrus to the finished beer (something missing from my previous Saison), so I mixed them in with the Styrian Goldings. This mash schedule is meant to reproduce Dupont's mash at 113F followed by a gradual increase in temperature to 162F over 105 minutes. This boil schedule should result in a color comparable to that of the real Dupont Saison. After the boil was over, I transferred the wort to a kettle and used my immersion chiller to bring it down to 82F. From there, I pitched it on top of the yeast cake left over from the previous Saison batch bottled earlier in the day. This may reduce the stress the yeast is under (since the yeast is unlikely to be underpitched this way) but hopefully that won't make a big difference. This should get close to the actual Dupont Saison fermentation process. Note: I pitched this atop the leftover yeast from the first Saison I brewed. Unfortunately, I forgot to close the spigot on the fermenter after bottling that one, and about a bottle full of wort ended up in a big puddle on the floor. This was both humiliating and irritating at the same time, and meant a lot of extra cleanup work. 02/17/2018: The brewing process went smoothly. and yielded 2.5 gallons of wort at what my refractometer measured at 15.5 Brix. After adjustment, this works out to a gravity of 1.065 SG, which is pretty close to the 1.068 SG the recipe crafter software predicted for the batch. Color was a touch darker than I thought it would be, given that the recipe contained only Pilsner malt, but that was the point of a 90-minute boil in Dupont's recipe. 02/25/2018: The airlock is showing no activity. A sample taken from the spigot on the fermenter looked like a fresh White Labs yeast culture. The aroma was mildly funky. The flavor was dry, slightly citrusy, and the hops seemed well-balanced against the malt. I think the beer will turn out well. The blend of EKG and Styrian Goldings yielded a good hop flavor as well. 02/27/2018: The beer was bottled and placed in the 85F "hot box" with Saison 1.0. By April 10 it should complete its conditioning period. 03/17/2018: I chilled and opened a bottle of the beer. It has an excellent aroma, everything you expect to get from a professionally-made Saison. The flavor is light and pleasant, mixing some peppery spiciness and fruitiness along with the funk. It's not too bitter, not sweet. 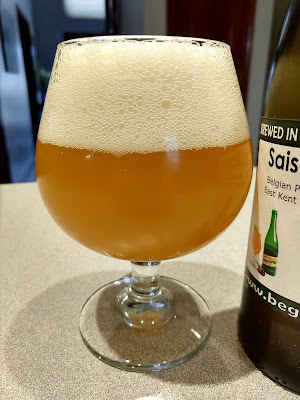 It's one of the best Saisons I've ever had - and much better than the 1.0 recipe I made earlier. The 1.0 recipe lacks the aroma element and is bland in comparison. Aroma (10/12): The aroma is funky, a little hoppy, and a little fruity. It could maybe carry a touch more spice to it or hint a little stronger of orange, but it's very good. Appearance (3/3): It's a nice orange-ish gold with thick white head that lingers a while and leaves behind lacing. It's hazy but not totally cloudy. Flavor (16/20): Hops bitterness hits initially, followed with orange and a hint of malty sweetness. The finish is pretty clean with a lingering peppery bitterness. Mouthfeel (4/5): It's got a medium body with plenty of carbonation. It could maybe be a little thinner, but it's pretty good as-is. Overall (8/10): This has all the elements of a classic Saison. The hop-forward aroma and flavor is present, but not overwhelming. The notes of spice and fruit in the aroma and flavor combine with the usual "Saison Funk" to make a nice, easy-drinking beer. It's not perfect, but it's pretty darned good. Delicate fruit, (not sure what the next word is) and honey-like grain sweetness, hint of citrus peel (mainly orange), earthy farmhouse notes are present, orchard fruits (apple, pear) as well. Strong (??) through head. Classic pils/hop character - faded quickly, no off aroma. Strong, dense head 1/2", persists. (??) Bubble support. Straw. Light haze. Dense lace! Earthy (autumn leaves), hint of orange peel and lemons, moderate hop bitterness, low-moderate hop flavor, esters a bit more than phenols (bubblegum, clove, chamomile), orchard fruits (mainly apple). A bit too much to allow anything to really shine. After some moments (??) vegetable flavor - infection? Neutral malt, over(??) by earthy infection flavors. No hop flavor. Light vegetal note. Spicy with malty after. Nice balance. Not a strong fruity element, but its in the background. Medium body. Low carbonic. Flat. Barely oily finish. Low to no alcohol evident. Carbonation good. Nice dry finish. Close. Flavors are a bit jumbled. Would like to see fruit flavors accentuated and brought forward, or focus more on spices and use fruit notes to compliment. Focus on one but not both. Possible infection as an odd vegetable flavor pushes atop the rest of flavors. Alas, a good Saison spoiled. Sediment and high carbonation without alcohol suggest a bottle contamination. Other bottles may be fine. At least two judges mentioned a vegetable flavor as a hint of a possible infection. That's something I will have to look for when I sample the next bottle. I try to be very meticulous about cleaning and sanitation, so that comment worries me. I've been trying to dial in carbonation using drops, since I've had too much in other beers because of inconsistent volumes coming out of the Zymatic. For this batch, I used a large Coopers drop and three small tablets. I probably should have used only one or two small tablets to nail the carbonation amount. I'll probably add some orange peel to the next batch to dial up the orange flavor. I'll also pitch on fresh yeast, as that may be where the notes of infection or vegetal flavors came from. Ultimately, I guess I liked this beer a lot more than the judges did. Aroma (5/12): Very muted apricot citrus aroma. Very low pepper spiciness. No hop aroma. No malt aroma. Appearance (3/3): Dark gold color. Very hazy. Huge, dense off white head that lasts a long time. Continuously renewed by excess carbonation. Flavor (10/20): Sweet start with a medium-low orange citrus flavor. Medium-low bitterness is low for style. No distinct hop flavor. Balance is to a lingering resinous citrus flavor. Finish is medium and aftertaste is alcoholic. Mouthfeel (3/5): Very high carbonation - too much for Saison. Body is medium. Warmth is medium-high and lingers. Too aggressive. Would be more refreshing with lower alcohol. Overall Impression (6/10): Good start. There is a distinct citrus character but could use some additional spiciness. Fermentation seems to have finished in the bottle leaving this overcarbonated and too high in alcohol. Read up on the specific yeast you used and what profile it wants to finish. Some yeasts will only ferment part way until the temperature is changed (putting in fridge). Aroma (6/12): Citrus spice with some malt in background. Spicy hops also in background. Appearance (3/3): Pale gold with huge creamy off white head. Hazy at first. Head is long lasting. Flavor (8/20): Sweet malt initially. Some citrus and hops in background. Creamy. Mouthfeel (2/5): Medium high carbonation and body. Alcohol is evident but may be more than the 7% guidelines call for. Overall Impression (5/10): Suggest less malt in grain bill. Too heavy a body for this style. Enjoyable to drink but misses guidelines for this style. Too malty and too heavy in body. Shift the mash profile toward the lower end of the temperature scale for a longer part of the mash to reduce the sweetness a little. Incorporate some sugar or perhaps Orange Blossom Honey in the grain bill to reduce the body and dry it out a bit. Include some grains of paradise and perhaps some citrus peel to amp up the citrus element. Consider Mandarina Bavaria hops or something else, perhaps even dry hopping a bit. Include a secondary fermentation to help further dry it out before bottling. Reduce the overall grain bill to drop the ABV down a little. We'll see what happens in a 3.0 version. Bosteel's Tripel Karmeliet is one of the best Belgian Tripels on the market. The official web site (linked earlier) claims that what makes the beer unique is its blend of three grains, which they claim is a recipe dating back to 1679. Roel Mulder, on his Lost Beers web site, researched the original recipe and shared it with the world. I scaled that recipe to the 2.5 gallon capacity of the Zymatic and gathered the ingredients to brew it. The photo at the right is of the actual finished home brew and of a bottle of the real Bosteel's beer, poured within seconds of one another. Note: I have since read an unsubstantiated report that Bosteels uses a Goldings hop variety in their Tripel rather than the Hallertau Mittelfruh reported in Mulder's recipe. This is something I'll consider doing if I brew this again. Dough in at 102F for 20 min. Ferulic Acid Rest at 113F for 10 min. Protein Rest at 120F for 10 min. Mash step 1 at 145F for 20 min. Mash step 2 at 157F for 46 min. Mash out at 175F for 20 min. I loaded the water into the Zymatic's keg, the grain and hops into the step filter, and fired up the machine. Having seen the Zymatic under-shoot volume on the last few batches, I added an extra 20 ounces of water to the keg. This, combined with the 9 pound grain bill (including wheat and oats), appeared to cause a problem. I stayed with the device through dough-in and it all looked good. When I came back about 30 minutes later, I had a serious mess on my hands. The Zymatic had foamed out the top of the step filter, and leaked a lot of wort from underneath the lid. The leaked wort covered about half of the top of the table on which the Zymatic sat, covered nearly all of the shelf underneath the table top, covered about 20% of the anti-fatigue mat next to the table, and ran from the table, past the shelves where I keep the clean bottles, underneath plastic bins containing grain, underneath the shelving unit I use to store grain, and made a garbage-can-lid sized puddle around the drain in the basement floor. It took me about 20-30 minutes to clean up this mess. After the Zymatic completed mash out, I noticed there was still a lot of wort in it, so I paused it and made it drain a bit more. When I went to resume the brew, it suffered a fatal error and rebooted itself. When it came back up, I had to restart the brew and step it past the mash process. Fortunately there were no leaks after that. The finished wort measured only two gallons, instead of the 2.5 gallons I should have gotten. I'm guessing the missing half gallon explained the puddles everywhere. Gravity measured 20.1 Brix which was right on target. I chilled the wort to 76F with my immersion chiller, pitched the entire package of yeast, and poured in half a vial of Clarity Ferm. I don't plan to use temperature control, to give the yeast a chance to feel a little stress and generate esters/phenols. This, combined with the ferulic acid rest, should allow the yeast to express itself. According to Wyeast, 1388 generates a complex ester profile, finishing dry and tart, which sounds like a good description of Karmeliet's oft-cited "lemony" note. 02/13/2018: A sample from the fermenter was cloudy. A fruity aroma hinting at banana, clove, and bubblegum. Flavor is sweet and malty with just enough hops to balance out. Gravity registered at 1.021 SG, which is right where I expected it to finish out, so it may overshoot my target gravity. I bumped the fermentation temperature up to 76-78F. 02/25/2018: The beer was bottled, but my available "hot box" options were limited thanks to the two Saison batches that needed very warm temperatures for six weeks, so I had to leave it out to condition at ambient basement temperatures of around 62-63F. 03/17/2018: I chilled a bottle of the beer and poured it for a side-by-side comparison with the real Bosteels product. The color of mine is a bit darker than the real beer. Both have excellent and high levels of carbonation. The aroma on mine hints at citrus, but the aroma of the real beer has a very clean and bright lemon note. I originally thought this might be coriander, but it seems much more like lemon peel or lemon zest to me now. It's almost a candy-like lemon aroma. The body on mine seems more full than on the real beer, which is lighter and thinner. Flavor is similar but I have to give the nod to the real beer there. Mine (as I suspected when I read the recipe) is also more bitter. The clone as brewed here is a good Belgian style Tripel, but the real beer is definitely better. 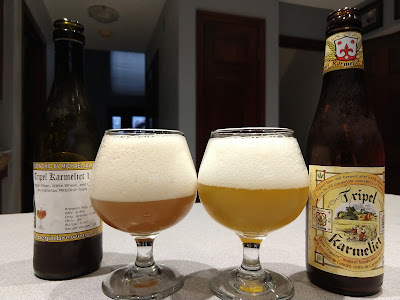 04/03/2018: A family member who loves Karmeliet tried this beer over the weekend and felt that it was better than the real thing. He liked how it finished better than real Karmeliet. I still plan to make some of the changes above when I brew it again soon. This post starts with a shout-out to the good folks at Adventures in Homebrewing. I recently ordered two batches worth of ingredients from them, one that became 2018 Belgian Dubbel v1.0. The other was intended to be this beer. Unfortunately, there was a mix-up and only about six ounces of the grain was shipped. When I contacted them to report the issue, they shipped replacement grain immediately and it arrived quickly. No hassle, no argument, nothing. That's the way to earn customer loyalty. I plan to do an all-Pilsner malt version in the future to see how it compares to this. This should mimic Dupont's mash schedule somewhat. They begin with a ferulic acid rest at 113F, then gradually raise the temperature to 162F over the next 105 minutes. It should result in a very fermentable wort and a dry Saison. Pitch a smaller amount of yeast than normal, to encourage stress on it. Place the fermenter inside my insulated zipper bag, after wrapping it with a heat wrap and a thin layer of insulation. After two weeks in the fermenter, transfer to a secondary fermenter and let it rest another week, possibly with gelatin finings added. Cold crash it and then bottle it, using corn sugar, and keep the bottles on their sides during conditioning. I'll consider adding a different yeast strain at bottling. Condition this way for six weeks. This should also mimic what Dupont does and result in a good Saison. My grain mill got stuck on some of the malt during crushing and I had to fight with it a bit to get it to finish the job. Fortunately that happened during the last few ounces of malt. Dough in and mash went perfectly. The grain bed got fully soaked and even had a layer of water on top of it, so I wasn't concerned about it failing to hit its gravity. It also did not foam significantly during the mash, which allowed me to focus on bottling my tropical stout and preparing the fermentation area to keep the fermenter warm enough. Gravity came up slightly high (1.058 vs. 1.055) and volume slightly low (2.4-ish gallons after adding some distilled water) but close enough. I setup temperature control to keep the beer at or above 82F throughout fermentation. There was plenty of aeration so I'm not worried there. I pitched about a third of a packet of White Labs WLP565 liquid yeast, which is a little low and intended to stress the yeast a bit to improve the formation of esters. The ferulic acid rest should help there, too. 02/07/2018: Over the last three nights, I watched the temperature of the fermenter and it hasn't seemed to go beyond about 81.3F. I saw no airlock activity for a minute or so. Concerned that I had underpitched the yeast too much, I took the risk of opening the fermenter and was rewarded with a Saison-ish aroma and the sight of about a half-inch of krausen atop the beer. Satisfied that fermentation is taking place, I sealed the fermenter and put the insulated bag around it to keep it warm. I'll check again on 2/11/2018. 02/13/2018: I raised the temperature on the fermenter to 93F to allow the fermentation to finish out. A sample taken from the fermenter measured 10 an adjusted gravity of 1.010 SG and ABV of 6.4%. I've heard stories of the Dupont yeast stalling out at a higher gravity, but did not experience it here. The sample is cloudy, a pale gold color, with a distinctive Saison aroma that's both a little fruity and a bit funky. The flavor is dry malt, with a definite hops presence, and a hint of citrus. The finish is very dry and slightly bitter. 02/17/2018: Today, my wife and I bottled the beer with 2.25 ounces of corn sugar. According to Alworth's book, Dupont bottle conditions their beer in a hot room with the bottles lying on their side. I loaded all but six of the bottles into my "hot box" on their sides, so that I could compare them with the bottles loaded upright. The temperature of the box has set to 82F. Following Dupont's example, I plan to condition the beer for six weeks. It should be ready for tasting around April 3. 03/17/2018: I opened a bottle of this for a side-by-side comparison with the 2.0 version made a bit later. By comparison, this version's aroma is much more sedate than the 2.0 version. The flavor is also somehow more bland than 2.0, despite 2.0 having only Pilsner malt in it. I'd stack the 2.0 version up to any Saison I've ever had. This 1.0 version has a very mild Saison "funk" to it, a slightly fruity and primarily malty flavor, with very little spiciness to it. It's a decent and drinkable beer, but definitely not the equal of the 2.0 recipe. In other words, it definitely has some room for improvement, but it's a pretty good Saison as-is. My Saison 2.0 version would probably score better.